Beth & Cory's Mom: Score Big Savings on Concert Tickets and More! I recently received an email asking me if I had ever tried ScoreBig. I replied that I had not, but I would be happy to check it out, see how it worked, and share my experience. I was provided with a coupon code to use toward the concert or event of my choice. The experience and all opinions are mine. You may not have heard of ScoreBig. I hadn't. To tell you the truth, we don't really attend many concerts, shows, or sporting events, so I'd only heard of the main ticket outlets like Tickemaster and LiveNation. And, to tell you even more truth - we don't attend many events because it just plain costs so much! That's why I was quite interested in ScoreBig because they promise you can save up to 60% on sports, concerts, and theatre tickets. I love saving money! Don't you? The way ScoreBig works is that you find the event you want to attend, choose your seating area (by choosing a seating area rather than an exact seat, you're giving the ticket providers the flexibility they need to give you great deals), and then make an offer for how much you want to pay for those seats. They tell you how much full-price tickets in that seating area are, and give you an indicator of your offer's potential for success. It's all up to you - offer what you want to pay. You'll know immediately whether or not your offer has been accepted. If your offer is declined, you may not be able to make another offer on the same seat rating for 24 hours. You can still make an offer on a different seat rating, if available for that event, or you just wait and see if you'll have better luck the next day. I decided to make an offer on some tickets for a Brad Paisley concert, which is coming up really soon. (We haven't seen Brad since the Walworth County Fair way back in, well, a number of years ago. Anyone remember when the Mud on the Tires tour was?) My first offer was not accepted, but they gave me another chance - so I did not have to wait 24 hours. That offer was not accepted either because I intentionally went in with another low offer, though it was higher than the first one, to see just how much I could save. When that second offer was declined, ScoreBig told me I could still get those tickets and made me a counter offer. While the price they quoted me was below full price, the savings weren't significant, so I decided to pass on those seats and try a different seating area. I went from what they call the 5-star seating area (closer seats, highlighted in purple on the seat map) to a 3-star seating area (either sections E or G on the seat map). My offer on those was declined, too, but I decided to go ahead and grab the tickets for the counter-offer quote ScoreBig gave me. Full-price tickets in both areas cost exactly the same if you go to Ticketmaster or LiveNation (yes, I checked), but the ScoreBig savings on the 3-star seating area were much better. Instead of saving almost $5 on each seat, which is what they offered me on the 5-star seats, I saved almost $20 on each seat. My husband said I should have grabbed the better seats, because with the coupon code ScoreBig gave me, the actual cost to us wasn't much. But I was doing this to test the site and see how much I could save. Once my order was confirmed and my tickets ready to ship, I found that our tickets are only 6 rows back in Section E, so I think I did pretty good! Less than 30 minutes after I placed my order, I had a FedEx Shipment Notification in my email, and my tickets were delivered 5 days later. It probably would have been quicker, but there was a holiday weekend in there. Note: your tickets may or may not come via FedEx. ScoreBig will decide the best way to get your tickets to you, whether shipping them to you, providing e-tickets, or having them for you at Will Call, they will be sure you have them in plenty of time for your event. And did I mention that there are no fees, and shipping is free? 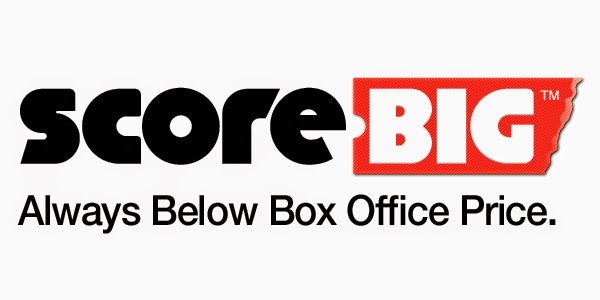 So, if you're looking to score some big savings on tickets to events in your area, be sure to check out ScoreBig. It's fun, and you could just be seeing some great concerts, or sporting events, or theatre, for a lot less than the people sitting all around you! I know I'll be checking it for future concerts I want to see.